Spacious and bright 1 bedroom 1.5 bathrooms with amazing Ocean and City views at boutique Mei Building. Resort like amenities includes complimentary beach and pool service, gym, spa, concierge, tea room and free valet parking. Top of the line appliances and high-end finishes. The apt features floor to ceiling impact windows, white glass porcelain floors throughout. Large Terrace. Bathroom has separate bathtub and enclosed shower with TOTO intelligent toilet. Maintenance fees includes high speed internet, phone and full package cable. Best priced for a non-obstructed view apt in the building. Unit is rented for $3,400 month to month. HUGE PRICE REDUCTION!!!!!!! High floor, very spacious 1 bedroom with 1.5 bathrooms unit in one of the most prestigious condos of the Millionaires Row in Miami Beach. 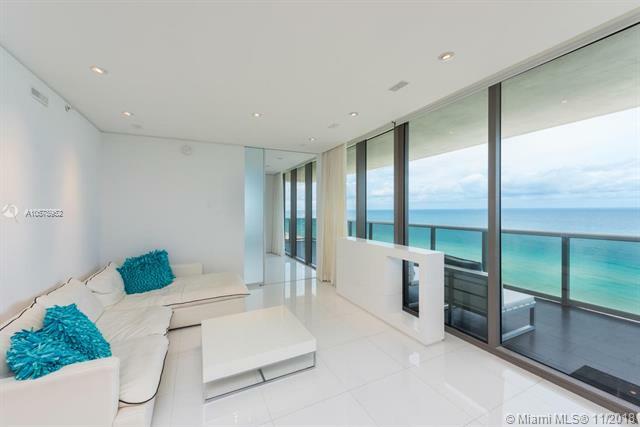 This condo has a huge terrace that offers panoramic views of the Ocean and Miamis skyline. South exposure is the most desired enjoy gorgeous sunrises and sunsets from your balcony. Equipped with top of the line Thermador appliances, espresso machine, wine cooler, convection oven. Enjoy the privacy and luxury of this boutique condo and the Miami Beach lifestyle with beach and pool service. Amenities include a sea level pool, oversize Jacuzzi, a state of the art gym, a tea lounge & library, concierge service, massage room & sauna, free valet for you & your guests and much more. Beautiful apartment with ocean view. Mei is a modern boutique building with only 140 units. Includes beach and pool services, gym, spa tea room and diverse places of ditration. Ideal to invest, is occupied by a tenant until January 2020. It can be seen at least 24 hours in advance. 2 bed / 2.5 bath with ocean and city views. Best value in the building. Priced to sell. Bring all offers. The unit has top of the line appliances uine cooler, built in coffee machine, washer & dryer, and marble floors. Unit has has stainless appliances, temperated glass windows, performance shower, spa tub, huge balcony to enjoy magnificent ocean and intracoastal views. Oriental style boutique building with resort amenities to include tea lounge, all valet, beach service, pool, Jacuzzi, gym, spa and much more. Ocean view unit with large balcony and access from all bedrooms. Owner including all furniture in sale, Unit was Nicely furnished two years ago. Unit Features tile floor thru out entire unit with custom closets and good living area. Amazing building with resort style amenities. Valet parking, pool and beach service, Front desk, fully equipped gym/spa. Gorgeous 2/2.5 waterfront condo w/direct ocean, intracoastal & city views, large balcony. Fabulous layout, split floor plan featuring marble floors, floor to ceiling impact windows and treatments, open gourmet kitchen with top of line appliances, built-in coffee maker & wine cooler, walk-in closets, beautiful bathrooms, washer & dryer inside unit. This boutique building offers resort-like amenities including state of art gym, yoga room, spa, steam room, bike storage, library, party room, beach & pool service, 24-hr Concierge & free valet service for owners and guests. Fabulous location in Miami Millionaires Road, minutes away from Bal Harbour and South Beach. High floor, immaculate conditions, PRICED TO SELL.........BEST VALUE IN THE BUILDING!!! CALL L.A.
Gorgeous unit located on the 21st floor at MEI Condo. 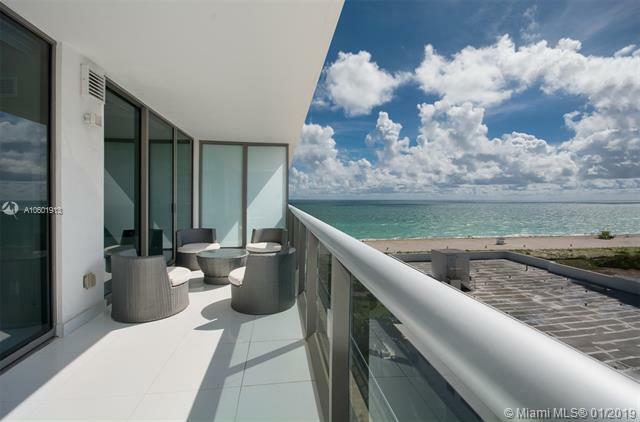 This unit in Miami Beach Millionaires row features 2 bedrooms and 2.5 bathrooms with marble floors, washer and dryer in unit, top of the line appliances and finishes, and a huge balcony with breathtaking views. Enjoy luxury resort style services at this boutique, resort-like building. with 24-hours concierge, front door service, valet parking, state-of-the art gym, spa, pool area, library, party room and direct access to the beach. Priced to sell! A designers dream home with every attention to detail and over 400k in upgrades. This Oceanfront beauty has magnificent custom wood edged drop ceilings, custom crafted entertainment system with hidden/pop-up TV, and stunning bathrooms. The Kitchen is a delight with the best German hardware and closures, top of the line appliances, honed matte finished marble flooring inside and on patio, custom lighting for Artwork, top of line HVAC unit and so much more. Affordable quality and design. The Mei is truly a boutique building with only 134 units on one of widest beaches in all of South Florida. This is a reason why the famed beach clubs in Miami were situated on the widest beaches. You will find all luxury amenities of the largest condominium properties here but just in a smaller scale. Exclusive boutique deluxe building. split plan top of the line appliances, beautiful decorated, ceramic floors and wine cellar. Two parking spaces valet parking free. (EXCELLENT INVESTMENT). ! !MAKE AN OFFER!! Great unit 2 BEDS 2 BATH and a half at exclusive boutique building on the beach. Ocean and city views from all rooms, marbles floors, huge closets. large balcony. Building offer many services: beach and pool service, concierge, library, valet, bike storage, gym, spa, yoga room, Internet, cable,Valet parking, concierge, security 24 hrs, steam room, gym, and spa. Unique corner lanai residence with expansive terrace (almost $1,500 sqft),ideal to entertain while enjoying the ocean breeze. Tastefully furnished by Tui Lifestyle, turn key 2 bedrooms 2/5 baths with beautiful marble flooring throughout and customized finishings. Top of the line appliances including built-in expresso coffee maker and wine cooler.One of a kind Asian inspired boutique building featuring Balinese style lobby, beach service, state of the art fitness facility, steam room, Zen library and more. Gorgeous 2 Bedroom 2.5 bath corner unit on the Prestigious Boutique 22 stories Full Services MEI Condominium. Designed by RBL Architecture, MEI condo is one of the most prestigious condo in Miami Beach. Decorated with an elegant Asian style. 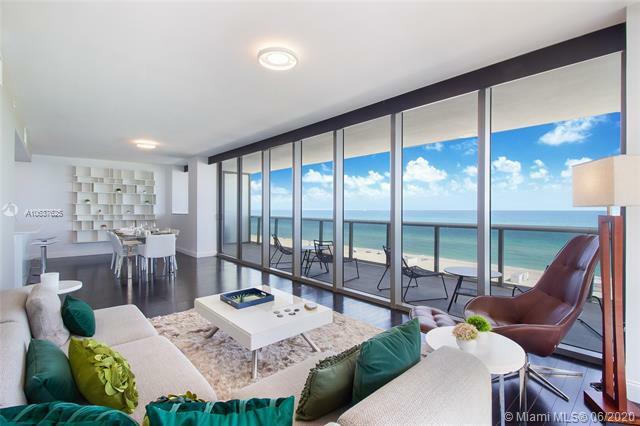 This unit features a wrap around balcony with breathtaking ocean and intracoastal view. Top of the line Bosch and Thermador appliances w/ built in expresso machine, wine cooler, washer & dryer. open kitchen, floor to ceiling impact glass doors. Mei offers the finest features, live the luxurious Miami Beach lifestyle w/ beach access & service, a sea level pool, a state of the art gym, a tea lounge & library, concierge service, massage room & sauna, 24 hs security, free valet and much more. You wont be disappointed. Very ease to show. Spacious design featuring spectacular Ocean and Canal views. Full-size Bosch and Franke stainless steel kitchen appliances. Tempered glass counters, Sub-Zero built-in refrigerator-freezer with cabinetry to match front panels. Built-in, full-size oven and microwave Touch-control ceramic radiant cooktop and built in coffee maker. MEi is a glittering jewel of shimmering glass, flowing water, imported silk and polished teak located on 175 feet of glorious white-sand beach on Miami Beachs legendary Millionaires Row- also home to such illustrious neighbors as the Bath Club, Canyon Ranch and Fontainebleau. MEis many amenities include a sumptuous Tea Lounge, Zen library, Spa and state-of-the-art Fitness Facility. Tranquility, privacy, and serenity is the mood of this incredible building. Splendid corner unit 2 bedrooms with panoramic ocean and city view, large open balcony throughout the whole apartment, all rooms have floor to ceiling impact glass doors. Impeccably mantained, breathtaking BAY and OCEAN views. Charming off white kitchen, high quality wooden floor, walk-in closets, spacious bathrooms. This luxurious apartment will leave you with a I WANT IT NOW feeling... Its cozy, its elegant, its modern its a DREAM apartment! Located in a boutique oceanfront luxury building. Resort style amenities include ocean front pool, beach services, state of the art fitness center, massage rooms, concierge services, valet parking and more. Conveniently located on Millionaires Row, 10 minutes to South Beach and Bal Harbour Shops. Request a showing ASAP! Imagine waking up every morning looking at the Oceans from your own massive ocean front terrace, the perfect place to entertain all of your guests and to relax in a private space. If your client is looking for something unique this is the perfect place. This pristine corner residence has two bedrooms and two and a half bathrooms with floor to ceiling windows, Thermador & Bosch appliances and has been professionally remodeled with the most exquisite taste. Mei is an Ocean front boutique building with resort like amenities such as beach service, heated pool, spa, state of the art gym, bike storage, concierge and free valet for guests. Cable and internet are included in maintenance. Owner is motivated, designer furniture (some exceptions) can be also purchased. LETS MAKE A DEAL TODAY! 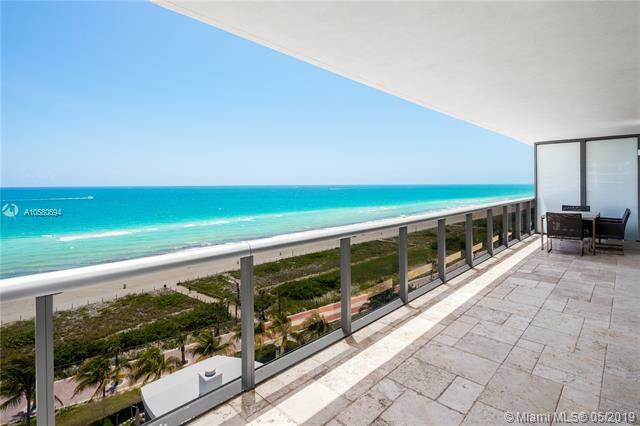 Direct oceanfront, corner unit featuring a 700 SF wrap around balcony with breathtaking views. This 2 bed/2.5 bath residence offers an open floor plan, floor-to-ceiling glass, and marble floors. The Asian influenced boutique style, luxury building on Miami Beachs Millionaires Row provides sophistication, tranquility, and a modern feel. Its amenities include spa, gym, 3 swimming pools, yoga room, Zen library, full beach service, valet, and concierge. Unit #1102 for sale next door provides the unique opportunity to combine 2 oceanfront, corners units to create a custom 3,050 SF residence. JUST REDUCED $400K TO $1.599M. Renowned interior designer, Briggs Solomon designed this chic, modern 2-bed/2.5-bath duplex penthouse setting it apart from all other units in the building. The unit offers oceanfront, Intracoastal and city skyline views which can be adored from the balconies on both levels. High-end stainless-steel appliances, wine cooler, espresso maker, induction stove top and built-in refrigerator with paneled doors fill this desirable chefs kitchen. Situated in the shimmering glass tower masterpiece, MEi luxury residences, indulgent amenities await from the tea lounge and library, spa, steam room and fitness center to the innovative smart technology, concierge services and beach access along with a pool and food and beverage services. Asian-inspired luxury full service 2008 building on the ocean. Amazing opportunity to own this elegant 3 bed, 3/1 bath residence with 1500 sq ft wrap around lanai terrace. Marble floors, open kitchen w/ high end appliances (wine cooler, espresso maker, Bosh in unit washer/dryer), electric window shades in all bedrooms, double sink in Master bath, Toto toilet, & built-in custom closets. Amenities include: beach pool service, state of the art gym, tea lounge, steam room & yoga room. 3 valet parking. This is the best priced 3 bedrooms unit in the building for sale. Your clients will be impressed, dont miss this opportunity. GREAT INVESTMENT OPP-- RENTED AT $7450/MONTH THROUGH APRIL 2020! 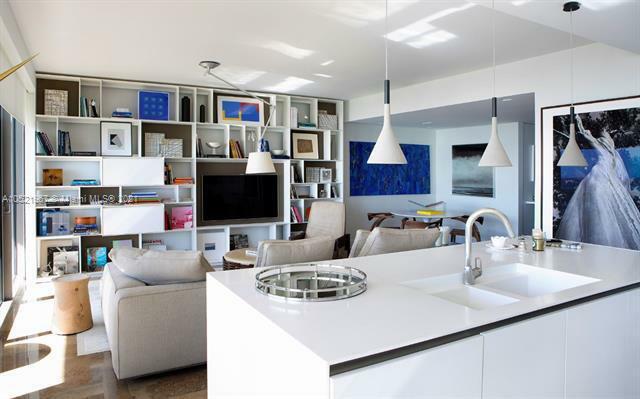 Designed by Cristina Mascarenhas of In Plus New York, this magnificent two-story penthouse sky home features a custom Kitchen, custom bathrooms, wardrobes, doors and built-ins, each provided by ORNARE. Other features include, custom ceiling and lighting work, motorized window treatments throughout and many other fine details. Beautiful southern exposure providing ample natural sunlight with clear views of the ocean and sweeping bay and golf course vistas back-lit by the downtown Miami skyline. Attractively priced, offered unfurnished. Spectacular views offered with this 3 bedroom, 3 bathroom ocean facing residence. Ideal corner location the 02 line offers 180 degree views of beautiful Miami Beach. The floor to ceiling windows enhance the breathtaking views and indoor outdoor living. MEI offers a plethora of amenities including a heated pool, spa, workout gym, valet service, 24 hour concierge, and beach service. STUNNING turnkey renovated 3/3.5 corner unit located in the prestigious MEI building. Unit offers, top of the line finishes, stainless steel Thermador appliances with built-In Expresso machine and Creston home automation. Sparkling marble floors throughout plus powered window treatments, built-in closets, upgraded doors, venetian plaster and full size washer & dryer. Wraparound balcony with BREATHTAKING views of Downtown Skyline and the Ocean. MEI is a full service, resort like ocean front building offering the best of both worlds for any homeowner! SPECTACULAR CORNER 3 BED 3.5 BATH HIGH FLOOR CONDO WITH OCEAN AND CITY VIEWS AT THE MEI CONDOMINIUM. THIS CONDO FEATURES MANY UPGRADES AND IS FLAWLESSLY DESIGNED IN A MODERN STYLE. THE WIDE WRAP AROUND BALCONY WILL BE PERFECT FOR THOSE LAZY DAYS SIPPING MOJITOS LOOKING AT THE OCEAN AND CITY SKYLINE. MEI IS A BOUTIQUE BUILDING THAT PROVIDES ITS GUESTS WITH PRIVACY AND AT THE SAME TIME RESORT-LIKE AMENITIES THAT INCLUDE: BEACH SERVICE, CONCIERGE, SPA, AN INFINITY POOL, VALET, GYM, YOGA ROOM AND LIBRARY. FREE VALET FOR YOUR GUESTS IS ALWAYS A MUST HAVE. CABLE AND INTERNET INCLUDED IN MAINTENANCE FEES. DONT MISS THIS SPECTACULAR OPPORTUNITY. 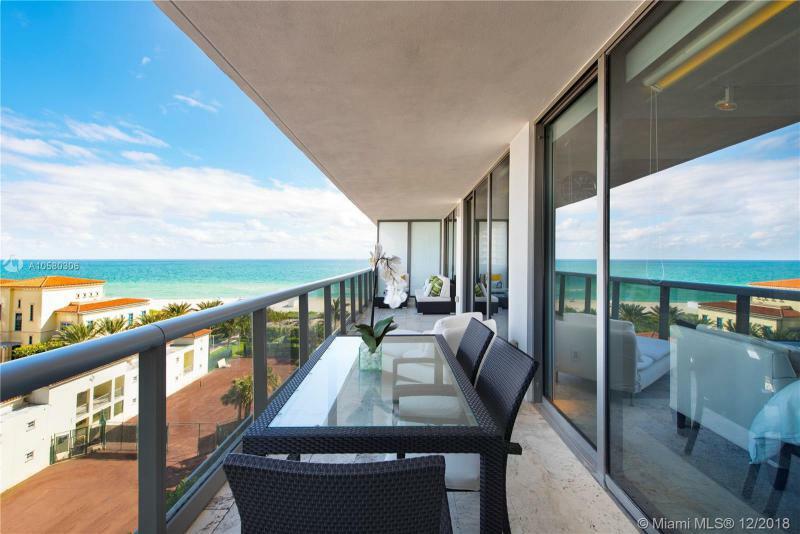 Stunning southeast corner unit, located in one of the most desirable Ocean front buildings in Miami Beach. 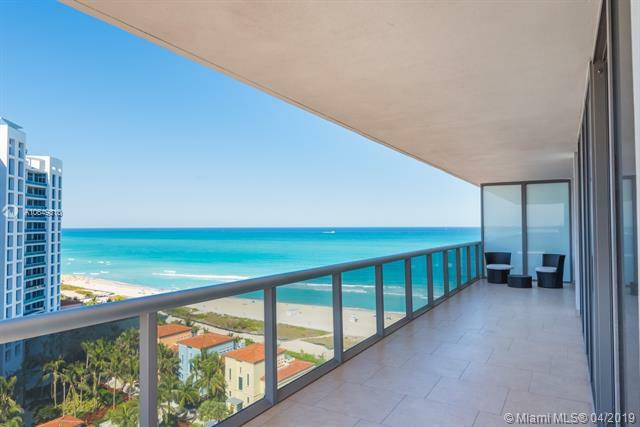 This 3 bed/3.5 bath unit boasts stunning panoramic views, a huge 774 sq.ft wrap around balcony, and an incredible living and cooking area with direct ocean views. Located on Millionaires row, Mei is a full service residence offering all of the amenities and service required for a truly luxurious lifestyle. State of the art gym, 3 swimming pools, yoga room, spa, Zen library, concierge, valet, direct beach access and beach service. This renovated 3 bed/3.5 bath corner unit offers floor-to-ceiling glass, a flow through floor plan, and sleek, white interior. Sought after 02 line has direct ocean and downtown Miami skyline views from its oversized wrap around terrace, perfect for watching sunrises and sunsets. The Asian influenced boutique style, luxury building on Miami Beachs Millionaires Row provides sophistication, tranquility, and a modern feel. Its amenities include spa, gym, 3 swimming pools, yoga room, Zen library, full beach service, valet, and concierge. Unit #1101 for sale next door provides the unique opportunity to combine 2 oceanfront, corners units to create a custom 3,050 SF residence. You have found the perfect 3 bedroom unit. Wide unobstructed ocean views from your wrap around terrace. Over the top finished for this ultra luxury unit at Mei. Nothing compares to this incredible unit: top of the line marbles, Italian porcelain, hard wood Italian doors, custom cabinetry and outstanding design finishes. This is one of a kind condo unit just for one buyer!